There aren't many UK chart updates left for the year, and the majority of big time releases are now out in the wild and scrapping over festive sales. 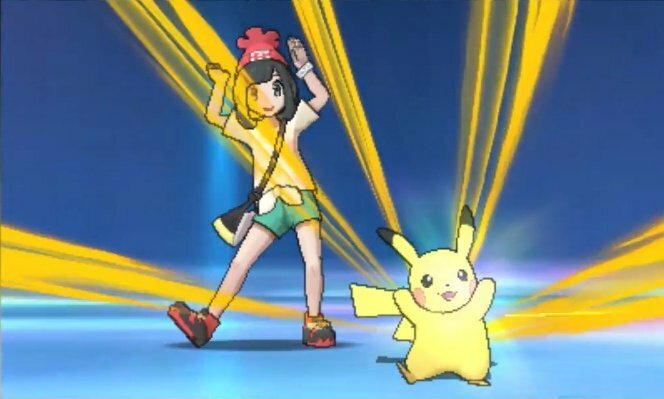 This week's results bring some decent results for Nintendo, along with a development in the great Pokémon Sun and Moon battle. Starting with non-Nintendo headlines, Call of Duty: Infinite Warfare is back at number one, while hotly anticipated PS4 exclusive The Last Guardian has arrived in 7th place. Both Sun and Moon are still in the UK top 10, though now it's Sun that's out ahead, a switcheroo from last week; Sun is in 8th and Moon is in 10th. Also doing well in the chart is Super Mario Maker for Nintendo 3DS, which has actually climbed the charts and gone from 25th to 19th in the all-format results. Chart-Track is counting both versions together, so as proof it's the portable version shifting some copies there's the single-format chart, in which the 3DS release has climbed from 25th to 17th place. It's still not exactly setting the charts alight, but its movement upwards is preferable to a rapid exit from the top 40. A couple of ever-present 3DS titles are clinging on in the lower reaches, too - Tomodachi Life is back in 37th place, with Mario Kart 7 in 39th. Not a terrible week from Nintendo's perspective, albeit with the proviso that being a relatively small player in the UK top 40 is deemed reasonable at this stage. Pokémon power, at the very least, continues to drive vital sales. I'm surprised Sun is ahead. Out of the people I speak to, Moon seems more popular. I have Moon. And Maker 3DS for that matter. I was saddened to discover the 3DS StreetPass option allows you to send a whopping amount of one course. At least you can receive more than one for each StreetPass hit. I wonder what place Sun & Moon would place if they were combined. Not all that surprised about Sun moving ahead of Moon... a lot of people buy the second game after they've completed the first, and considering Moon was the most popular initially, then that would make Sun the most popular as a second purchase. @Mega_Yarn_Poochy They should definitely be counted as one release. @crimsontadpoles It's the opposite for me, most people I know who've played a Gen 7 game, it's typically Sun. I thought I was odd for choosing Moon. Tomodachi Life still popular ? I bought both Sun and Moon plus Mario Maker. MM is a lot of fun so far. "Pokémon Sun Beats the Cheeky Moon"
@DragonEleven But Sun sold more than Moon Week 1, where the vast majority of these sales would have occurred. Sales in week 2 and 3 would have been around 20% of whatever was sold in the first week. I got Sun, but can someone who has Moon confirm how cheeky it is on the scale of 1 to Nando's? @Peach64 People preordering both versions (or having their second game preordered for them by someone else) would have caused a similar effect in the first week... the second week would have had the least impact from second game purchases. Of course, this is all assuming that the figures for each version are substantially different... for all we know the difference could be so small that their order is irrelevant. @Mr_Zurkon why didn't you buy it for the Wii U? @polivar4 Simple, I don't have one. Tomodachi Life will never die! @Mr_Zurkon May I buy one for you? @polivar4 That's a very nice offer. NL conveniently neglects to mention that Just Dance 2017 rose 10 positions up to number 12 on the all-format charts, with the Wii version leading the charge. Yet they bother to tout the miniscule sales at places 37 and 39. NL - fail and unbalanced. @Mr_Zurkon you need to play ZombiU you are missing out on the best game that utilizes the gamepad properly! @polivar4 I've heard that. Many here have said it is a pretty good game. @Mahe Because people really don't care about Just Dance on this website, from what I've seen. I'm not surprised. I wouldn't want to be playing with it always dark. If I ever get the game I will get Sun just for that reason alone. @Alshain01 It's not always dark, the day-night cycles between the two are flipped. @Mr_Zurkon right, so if you keep normal hours, it's always dark when you are playing. I sleep at night and play during the day like a normal person. I suppose people who work an altered (graveyard) shift might find Moon appealing but that is a minority. @Alshain01 I keep normal hours as well and It was not an issue, plus certain things/pokemon are only found during the day or night so you will have to deal with it anyway, at least until post-game. @Mr_Zurkon Well maybe I will just skip the generation entirely then. I hated playing Y in the dark, just as the sun started going down I'd be done with the game for the day. I really need to be saving my money for Breath of the Wild anyway. Given the choice between the two, this game looks like pac man in comparison. As expected, the holidays seem to have lifted Mario Maker 3DS up the sales charts by quite a bit. I wonder how much further up it will go once Super Mario Run is released. I'm hardly suprised by Tamadochi Life, considering Nintendo are actually advertising the game on tv. Here in my area, it seems Sun is more popular. A number of my local stores sold out, while Moon is still plentiful. You'd think in New York it would be the other way around, right? Also dude If you skip sun moon gen altogetger youre really missing out. They are pretty good games and may rank amongst the best selling pokemon games if not best selling 3ds games altogether. Youd really be missing a good game if you didnt buy this and you already own a 3ds considering people are buying the 3ds just for this game. I bought Sun because I preferred Solgaleo, that's about as complicated as the choice got. Lunala looks like something you'd find lying dead on the Bat-Signal. I think @DragonEleven may be onto something with his "second purchase" idea though. Still strange people still need to buy two copies though... completed my version exclusives day one through GTS. @bolt05 Oh I understand some people will like it, I'm just saying I don't think the majority will and that's why Sun has taken off. The fact you purchased moon so you didn't have to play at night actually confirms my statement. As for the game, I have two of them (Y and AS) and quite frankly they are both the same game practically. I don't have a lot of money and there is no way I'm passing on BotW. Maybe if they go on a Nintendo Selects sale in a few years. @Alshain01 I take your point, but lets not get ahead of ourselves this article didn't say sun has outsold moon, it says it is higher in the charts this week. I think the general consensus online is that moon sold better initially, have to wait and see if there really is much difference between the two in the long run. You are right, catching pokemon is still catching pokemon and the battles have not changed since red/blue/yellow. I kind of wish they had removed all of the existing pokemon and made the game with all new pokemon completely so it could be a new discovery altogether. I hear you on the limited funds too, gotta be choosey with games these days they're pretty expensive! @buildz It's still notable, important news. I hope Nintendo Life doesn't want to be the Fox News of Nintendo news, cherrypicking and even distorting news to fit their agenda.